Lido Golf Club’s simple logo depicts a wind-blown tree, its trunk emerging from the year 1914 scrawled underneath. 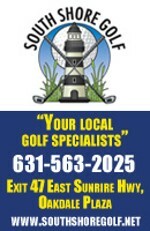 That would mean, of course, that this 2014 golf season is one due for a centennial celebration along Nassau's south shore. The roots of the popular municipal layout reach only as far back as mid-century, however, when renowned designer Robert Trent Jones built the course in the years following World War II. Unlike the current course, the old Lido (pictured above in the 1930s) ran from the interior waters on the north side of the barrier island all the way down to the Atlantic. On one side, the course featured a unique “Channel” hole, a risk/reward challenge with dual fairways surrounded by a lagoon. Today’s 16th hole is a replica of Macdonald’s original. On the opposite end, a par-3 paralleled the beach just a pitch away from the surf, and a luxury hotel and clubhouse built in the 1920s towered over the oceanfront holes. In between, the course demanded that golfers steer clear of untamed rough and penal waste areas modeled from great European holes of the era. Unfortunately, the club’s boom period was short and poorly timed. World War I redirected attention while the course was still in its infancy. Later, the Depression delivered its own powerful blow. What remained of the course property during World War II was overtaken by the military and used for wartime purposes. Today, old Lido is buried beneath homes, schools and streets with names like Fairway Road. The former clubhouse – now a condo complex – remains a prominent, elegant fixture on the island skyline. Long Beach High School sits atop the Channel hole, though aerial images reveal that part of the original lagoon still exists as a pond on school grounds. About a half-mile to the east, players on the Jones-designed municipal course tee off on the new Channel hole, directing shots over replica fairways while enjoying the same waterfront scenery as their predecessors next door. For more on the modern Lido, check out the course flyover and this Closer Look at the 16th. 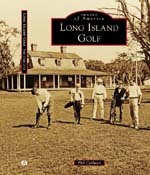 Golf On Long Island's recently published book entitled "Images of America: Long Island Golf" contains additional photos and history of the original Lido Club.